Explain the formation of a chemical bond. Write Lewis dot symbols for atoms of the following elements: Mg, Na, B, O, N, Br. The dinegative charge infers that there will be two electrons more in addition to the six valence electrons. Hence, the Lewis dot symbol of S2– is . The tripositive charge on a species infers that it has donated its three electrons. Hence, the Lewis dot symbol is . Define octet rule. Write its significance and limitations. Write the favourable factors for the formation of ionic bond. Although geometries of NH3 and H2O molecules are distorted tetrahedral, bond angle in water is less than that of ammonia. Discuss. How do you express the bond strength in terms of bond order? (10–12 m) and are measured by spectroscopic X-ray diffractions and electron-diffraction techniques. In an ionic compound, the bond length is the sum of the ionic radii of the constituting atoms (d = r++ r–). In a covalent compound, it is the sum of their covalent radii (d = rA + rB). Explain the important aspects of resonance with reference to the ion. According to experimental findings, all carbon to oxygen bonds in are equivalent. Hence, it is inadequate to represent ion by a single Lewis structure having two single bonds and one double bond. H3PO3 can be represented by structures 1 and 2 shown below. Can these two structures be taken as the canonical forms of the resonance hybrid representing H3PO3? If not, give reasons for the same. The given structures cannot be taken as the canonical forms of the resonance hybrid of H3PO3because the positions of the atoms have changed. Write the resonance structures for SO3, NO2 and . Use Lewis symbols to show electron transfer between the following atoms to form cations and anions: (a) K and S (b) Ca and O (c) Al and N.
Although both CO2 and H2O are triatomic molecules, the shape of H2O molecule is bent while that of CO2 is linear. Explain this on the basis of dipole moment. According to experimental results, the dipole moment of carbon dioxide is zero. This is possible only if the molecule is linear so that the dipole moments of C–O bonds are equal and opposite to nullify each other. H2O, on the other hand, has a dipole moment value of 1.84 D (though it is a triatomic molecule as CO2). The value of the dipole moment suggests that the structure of H2O molecule is bent where the dipole moment of O–H bonds are unequal. Write the significance/applications of dipole moment. The product of the magnitude of the charge and the distance between the centres of positive-negative charges is called the dipole moment (μ) of the molecule. It is a vector quantity and is represented by an arrow with its tail at the positive centre and head pointing towards a negative centre. Define electronegativity. How does it differ from electron gain enthalpy? Explain with the help of suitable example polar covalent bond. Arrange the bonds in order of increasing ionic character in the molecules: LiF, K2O, N2, SO2 and ClF3. The skeletal structure of CH3COOH as shown below is correct, but some of the bonds are shown incorrectly. Write the correct Lewis structure for acetic acid. Apart from tetrahedral geometry, another possible geometry for CH4 is square planar with the four H atoms at the corners of the square and the C atom at its centre. Explain why CH4 is not square planar? 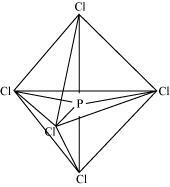 For a square planar shape, the hybridization of the central atom has to be dsp2. However, an atom of carbon does not have d-orbitalsto undergo dsp2 hybridization. Hence, the structure of CH4cannot be square planar. Explain why BeH2 molecule has a zero dipole moment although the Be–H bonds are polar. 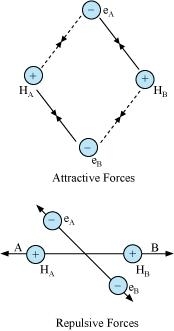 Dipole moments of each H–Be bond are equal and are in opposite directions. Therefore, they nullify each other. Hence, BeH2 molecule has zero dipole moment. Which out of NH3 and NF3 has higher dipole moment and why? Thus, the resultant moment of the N–H bonds add up to the bond moment of the lone pair (the two being in the same direction), whereas that of the three N – F bonds partly cancels the moment of the lone pair. 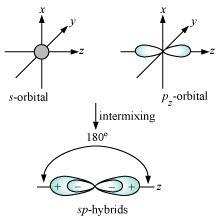 What is meant by hybridisation of atomic orbitals? Describe the shapes of sp, sp2, sp3 hybrid orbitals. Describe the change in hybridisation (if any) of the Al atom in the following reaction. To form AlCl4–, the empty 3pz orbital also gets involved and the hybridization changes from sp2 to sp3. As a result, the shape gets changed to tetrahedral. Is there any change in the hybridisation of B and N atoms as a result of the following reaction? After the reaction has occurred, an adduct F3B⋅NH3 is formed as hybridization of ‘B’ changes to sp3. However, the hybridization of ‘N’ remains intact. 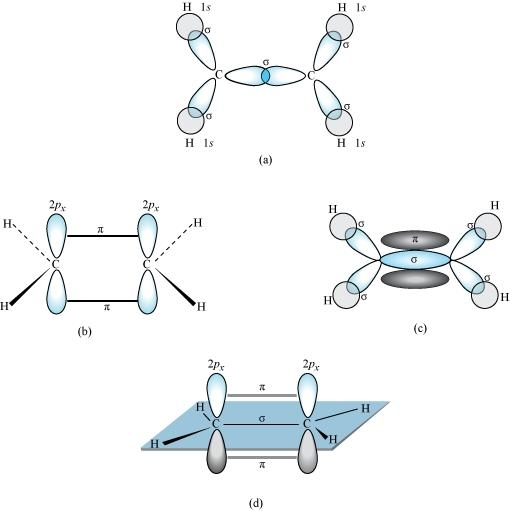 Draw diagrams showing the formation of a double bond and a triple bond between carbon atoms in C2H4 and C2H2 molecules. In the formation of an ethane molecule (C2H4), one sp2 hybrid orbital of carbon overlaps a sp2hybridized orbital of another carbon atom, thereby forming a C-C sigma bond. The remaining two sp2 orbitals of each carbon atom form a sp2–s sigma bond with two hydrogen atoms. The unhybridized orbital of one carbon atom undergoes sidewise overlap with the orbital of a similar kind present on another carbon atom to form a weak π-bond. In the formation of C2H2 molecule, each C–atom is sp hybridized with two 2p-orbitals in an unhybridized state. One sp orbital of each carbon atom overlaps with the other along the internuclear axis forming a C–C sigma bond. The second sp orbital of each C–atom overlaps a half-filled 1s-orbital to form a σ bond. What is the total number of sigma and pi bonds in the following molecules? Considering x-axis as the internuclear axis which out of the following will not form a sigma bond and why? (a) 1s and 1s (b) 1s and 2px (c) 2py and 2py (d) 1s and 2s. 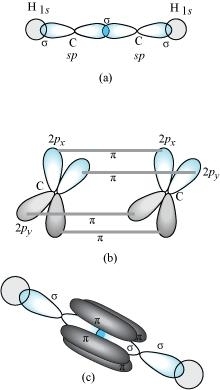 2py and 2py orbitals will not a form a sigma bond. Taking x-axis as the internuclear axis, 2py and 2pyorbitals will undergo lateral overlapping, thereby forming a pi (π) bond. Which hybrid orbitals are used by carbon atoms in the following molecules? What do you understand by bond pairs and lone pairs of electrons? Illustrate by giving one example of each type. Distinguish between a sigma and a pi bond. 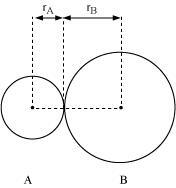 (a) It is formed by the end to end overlap of orbitals. It is formed by the lateral overlap of orbitals. (b) The orbitals involved in the overlapping are s–s, s–p, or p–p. These bonds are formed by the overlap of p–p orbitals only. (c) It is a strong bond. It is weak bond. (d) The electron cloud is symmetrical about the line joining the two nuclei. The electron cloud is not symmetrical. (e) It consists of one electron cloud, which is symmetrical about the internuclear axis. There are two electron clouds lying above and below the plane of the atomic nuclei. (f) Free rotation about σ bonds is possible. Rotation is restricted in case of pi-bonds. Explain the formation of H2 molecule on the basis of valence bond theory. Write the important conditions required for the linear combination of atomic orbitals to form molecular orbitals. Use molecular orbital theory to explain why the Be2 molecule does not exist. The electronic configuration of Beryllium is . Write the significance of a plus and a minus sign shown in representing the orbitals. Describe the hybridisation in case of PCl5. Why are the axial bonds longer as compared to equatorial bonds? There are five P–Cl sigma bonds in PCl5. Three P–Cl bonds lie in one plane and make an angle of 120° with each other. These bonds are called equatorial bonds. The remaining two P–Cl bonds lie above and below the equatorial plane and make an angle of 90° with the plane. These bonds are called axial bonds. Define hydrogen bond. Is it weaker or stronger than the van der Waals forces? What is meant by the term bond order? Calculate the bond order of: N2, O2, and .